Summer — the summer season of impromptu picnics, garden get-togethers, and lazy dinners — needs hospitable and everyday sweets that can come together quickly and supply everyone from large to tiny. That is one of my favorites: A one-bowl butter dessert, baked in a fairly dish, and topped with tangy whipped ointment and heaps of summer time good fresh fruit. Easy as one-two-three, and stunning too. The beds base with this summery dessert is my favorite one-bowl butter dessert, which mixes up quickly and doesn't also require you to utilize a separate dish for the flour and cooking powder. The cream ahead is an instant blend of whipping lotion and bad cream; the tanginess lightens the rich dessert. Then the fresh fruit — just get crazy. I like the contrast of colors here, with rosy strawberries, juicy blackberries, and ripe peaches. However you might use any stone-fruit or berries. If you'd like to get actually crazy, drizzle with chocolate, although I don't believe good fresh fruit similar to this requires that at all. Simply ensure that it it is easy! Preheat the oven to 350°F. Ready a 9x13-inch cooking pan by greasing it carefully with baking spray. Make use of a hand mixer or stand mixer to conquer the softened butter and sugar collectively until fluffy and light, you can add the eggs and beat until totally incorporated and creamy. Beat within the flour, sodium, cooking dust, last but not least the milk and vanilla. Defeat the cake batter on reduced for 30 seconds, then medium-high for three full minutes. Straight away pour in to the prepared cooking pan and bake for 40 to 45 minutes, or before tops spring back a little whenever pushed and a toothpick placed close to the center is released clean. Cool the dessert completely, for at the least an hour or so. Beat the cream, sour cream, powdered sugar, and salt collectively until smooth peaks form. 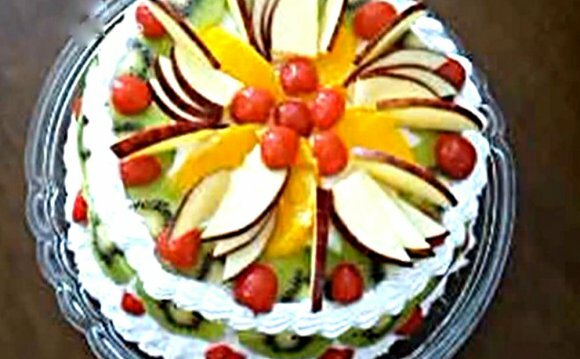 Spread over the cooled cake, after that top using the sliced or sliced fresh fruit.